Worldwide high-tech businesses, a store owner whose family has more than 100 years of history in the city, and an Olympic gold medalist who has run all over the world. They all have one thing in common. They Choose Hampton. "Hampton is a small town that has a certain character to it, and that makes it a really wonderful place to live." Photographer Bob Harper finds a lot to love in Hampton. Although he focuses on family portraits in his Downtown Hampton studio, Harper also appreciates the unique historical and waterfront settings all within walking distance. Since 1995, Harper has found Hampton a welcoming home for his art. Watch the video here. "We love it here in Hampton. Hampton has been a wonderful home for us, and we look forward to many more years here in Hampton." A longtime seafood company, L.D. Amory & Co. turned 100 this year. Owner Meade Amory says his great-grandfather moved the company from Poquoson to Hampton in the 1930s and never looked back. They now have one of two working seafood docks and have developed their business to transport seafood to major cities in the Midwest and locally. Watch the video here. "The heritage of the city was founded on the seafood industry. ... We're part of it. We are Hampton." Graham & Rollins Inc. has chosen Hampton for 75 years. The fourth-generation-owned and -operated company thrives on the picturesque waterfront location and owner Johnny Graham says his family will continue to choose Hampton. Watch the video here. Jump rope is not just for kids anymore, and the folks at Crossrope are excited about the future of their weighted rope system. Go online to see why a local enthusiast chose Hampton to highlight jumping "without limits." Choose Hampton is a continuing campaign that highlights the city as a great place to live, work or play. Watch the video here. "Hampton is the center of technical as well as cultural activities throughout Hampton Roads." Bruce Anker choose to move to Fort Monroe after visiting for the first time. An artist and active community member, Bruce serves on the Hampton Downtown Exchange, Mayor's Book Club and the Hampton Roads Philharmonic. Watch the video here. International blues camp chooses Hampton for a week of mentoring, music and community concerts. The American Theatre and the Blues Kids Foundation proudly present Fernando Jones' Blues Camp this week for student musicians ages 12 to 18. Blues performer Jackie Scott talks about her involvement and why Hampton is the perfect location. Featured musicians are local camp participants Tyler Bevington (vocals) and Ricky Cordner (guitar). Watch the video here. “There’s a million things to do. Hampton’s got something for us every day." Resident Susan Nadeau is a mom of twins who uses Bluebird Gap Farm and other Hampton venues and events to keep her active boys busy. Watch the video here. "Hampton provided me the opportunity to find my passion for golf." Isaiah Belton started playing golf at nine years old and has gone on to become the number one junior player in the area. As a recent Phoebus High School graduate, Isaiah is preparing to attend Virginia State University in the fall and continue his passion for the game of golf. Watch the video here. "I choose to live and work in Hampton because I'm drawn to the downtown waterfront." Since moving to Hampton in 2003, Kate Lawrence has found a way to live, work and play downtown. Listen to Lawrence talk about her love of the waterfront, and why she chooses to make Hampton an integral part of her life. Watch the video here. Logan Shermeyer started getting tattoos when he was 18, and the interest kept growing. Today he’s an artist at Folk City Tattoo in Hampton who is looking forward to the Annual Hampton Roads Tattoo Festival at the Hampton Roads Convention Center. Watch the video and find out more about Folk City and the festival. Watch the video here. Choose to make a difference by being active in your neighborhood. Hampton’s Neighborhood Commission is much more than just a bunch of people sitting around talking about where they live. Chairman Steve Edwards says the commission wants to serve as a conduit between citizens and city officials and to “get people to feel like they belong in their neighborhoods.” Watch the video here. "Choose Hampton for a holiday staycation." The Hampton Convention and Visitor's Bureau reminds us of all the wonderful local attractions Hampton has to offer in their fun holiday video. Watch the video here. This holiday season, Hampton is launching a campaign to encourage citizens to shop local. You may start seeing "shop local" spray chalk stencils popping up around town. 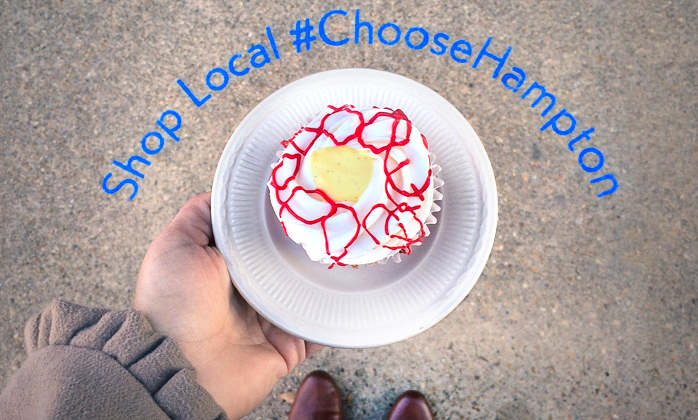 We encourage you to take a second to take a picture outside your favorite business, post to social media with #ChooseHampton and support Hampton businesses. Watch the video here. Steve Brown is a local resident, minister and community activist who works tirelessly to help make Hampton a better place to live, work and play. Hear why he chooses Hampton to live, work, play and make a difference. Watch the video here. "Japanese Anime enthusiasts choose Hampton for NekoCon 17." Costumed role-players Angel Nordike and Caitlin Taffe come dressed for the 2014 anime convention, NekoCon. Find out why this Hampton event draws 5,000 fans each year. Watch the video here. "From fresh produce to giving tours, we’ve chosen to grow our family business in Hampton for over 50 years." Woods Orchard is part working farm, part market, part tourist attraction -- and all family, says Billy Woods. Three generations hop into action when busloads of children arrive to take a hayride through the pumpkin patch, see bee hives and learn how food is grown. Watch the video here. "I have performed on national stages but I choose to perform locally because of the energetic Bay Days crowds!" 17 year old Smithfield native Bria Kelly is a local and national favorite. Her talented voice and guitar playing made her a “Season 7 Semi-finalist” on "America’s Got Talent”. Although she performs nationally, you can also find her at many local venues including the 2014 Bay Days Festival. Photo Credit: Lee Rosenberg, East Beach Photography. "Our daughter has just blossomed into this environment. We really are grateful that we chose Hampton City Schools." Watch as military retiree and Department of Defense employee Michael and Anna Bennett explain why they chose Phenix Pre K-8 for their daughter to attend. Watch the video here. "I was born and raised in Hampton's Aberdeen Gardens and chose to return because there is nowhere else I'd rather be." As a military wife, Margaret Wilson traveled around the world with her husband. But when it came time to put down roots again, she chose to come back and support the neighborhood she calls home, historic Aberdeen Gardens. Wilson’s story is part of Choose Hampton, a campaign to build pride and excitement in our community, highlight the city’s successes and build our business base. Watch the video here. "We choose to celebrate diversity with International Children’s Festival, join us!" organizers have chosen Hampton to be home for this international celebration. Watch the video. "The dedicated and highly skilled workforce make Hampton the perfect choice for Alcoa Howmet." Headquartered in Cleveland, Alcoa Howmet is a world leader in the casting of superalloys for jet engines and airframes as well as industrial gas turbine engine components. With 27 manufacturing facilities worldwide, the company chooses to stay in Hampton because of the dedicated and skilled workforce, access to secondary education for employees, and convenient location. Watch the video. "Our customers come from all over the state and beyond, but we choose to locate our business in downtown Hampton." Controlled sales, negotiated sales, auctions, appraisals and evaluations are just some of the services offered by Hampton House Auctions and owner G. Amory LeCuyer. There is detailed explanation of the company’s philosophy on the Hampton House home page, www.hamptonhouseauctions.com. It ends by saying: “Even if we are not the solution we probably know who is.” Hampton House Auctions chooses downtown Hampton as its home. Watch the video. "I run all over the world, but I choose Hampton as my home." Olympic Gold Medalist Francena McCorory is a track and field star, who travels around the world to race in places like London, Monaco, Stockholm and Zurich. But she always comes home to Hampton. Watch the video.